He does not lie in the pantheon of great artists and his work does not fall under the genre of grand painting ; some would even say that his art is repetitive, a succession of views of Mount Vesuvius meant to sell briskly as souvenirs of the Grand Tour. Emilie Beck Saiello has nevertheless set out to reinstate the artistic legacy of Pierre Jacques Volaire, known as the Chevalier Volaire, by publishing the catalogue raisonné of his works at Arthena Ed. She explains that « art history is not made up of only great masters just as history is not made up only of great men and the study of a successful or ’commercial’ artist might lead us to discover how his work reflected the taste, culture and aesthetics of a certain period and was able to express a moment, a place and a society ». Ms. Saiello thus offers us a « monographie problématisée » of the painter , richly illustrated with full page images, at times even large unfolding reproductions (not always helpful when reading), whereas the catalog itself, strictly speaking, is illustrated with black and white pictures. This publication takes a close and erudite look at the artist’s career, corresponding to a transitional period which sees the end of the Ancien Régime and the birth of a new society brought about by the Revolution, which bears witness to « the end of classical Reason and the blooming of Romantic passions ». Volaire became a painter in Toulon. Few documents remain about his life here, but the author reminds us that he came from a dynasty of artists, the grandson of Jean (1657-1721), the son of Jacques (1685-1768) and the nephew of François-Alexis (1699-1775) who were all painters, decorators and cartographers for the city and its shipyards. There were other artistic families from Toulon also : the Jacques, the La Roses, the Vanloos. Perhaps because the city provided frequent opportunities for commissions, principally from the Army and the Church, both for the shipyards as well as for the churches and religious congregations. Of course, Aix-en-Provence, Avignon and Marseille were just as attractive and although, according to Emilie Beck Saiello, Provence was one of the birthplaces for landscaping painting in France, this southern school remains, alas, relatively unfamiliar. In fact, the author rejects the term of « school » and prefers to speak of Provençal « center » in the 17th and 18th centuries. Volaire met Vernet in 1755 and worked with him on the famous cycle of French ports. Unfortunately, there is little information about this collaboration, but Emilie Beck Saiello qualifies the findings of late 19th century art historians (Léon Lagrange, Charles Blanc) who belittled Volaire’s contribution. Although Vernet apparently only availed himself of other artists intermittently, he collaborated regularly with Volaire over a seven to eight year period, thus making an exception. The Toulon native settled in Rome in 1763 and entered the Académie de Saint Luc in 1764 as a seascape painter. Not many of the works from this period remain. However, there are recurring themes : first of all, scenes of ports (ill. 1) and bathers, then storms and shipwrecks, finally fires and night scenes ; all of these subjects of Northern inspiration are somewhat analogous to those used by Vernet ; but it would seem that Volaire showed no compunction in exploiting his master’s celebrity. It was in Naples though, where he arrived in 1768, that he became successful in his own right and produced paintings which finally set him apart from Vernet. Taking up scenes with water, falls and shores, Volaire was « swept away by the lava ». An obligatory stop on the Grand Tour, the city attracted many painters fascinated by Vesuvius, and driven by the incentive of the many tourists who never left without buying a souvenir image. Emilie Beck Saiello lays out the political, economic and cultural context of the city : the Spanish Bourbons had replaced the Austrians in 1734, transforming the city to reflect their influence. Ms. Saiello also traces Volaire’s family and social life, provides details about the French community in Naples and more generally the artists living there, as well as the schools and the academies. Finally, she focuses on the business of art and the way in which Volaire earned his living : he received official commissions, notably from the Russian Empress and Ferdinand IV, but also sold works directly at his workshop or through dealers. His customers were mainly foreigners, and he responded to the demand for souvenirs running the risk of repeating the same formulas. However, Volaire also frequented scientific circles due to his interest in Vesuvius, then a focus for scientists who proposed theories about the origins of the planet. The field of scientific illustrations also developed but the painter did not feel « a vocation as an illustrator or topographer. His training with Vernet had accustomed him to retranscribe nature’s aspects and manifestations truthfully but accomodating them afterwards to criterias of good taste and to his own style ». The author analyzes the artist’s practices and the number of paintings replying to commercial requests and the demands of the market. Existing documents do not tell us for certain whether or not Volaire took on any assistants ; he seems to have worked on his own, without even the help of a character painter, as evidenced by his sketches of figures. Studies of fishermen or tarantella dancers...his drawings also reflect his interest in the local Neapolitan folklore found in his canvases. His work methods are not well known as he did not leave behind a treatise and his correspondence was not passed down intact. Ms. Saiello however puts forth some ideas on his creative process by examining his drawings, paintings and whatever is known about Vernet’s manner. She distinguishes the « live » studies, the ensemble studies, the use of models and the final stage in the production of the paintings. Volaire’s manner evolves from the Roman works, arranged landscapes which correspond to a generic picturesque manner (ruins, bathers, fires) after Vernet ; in Naples however, his works resulted from direct observation, influenced by both an aesthetics of the sublime as well as the realism required by his clients. He elaborated his landscapes in his workshop based on elements from life, thus applying an empirical approach, a far cry from the idealized French landscape of the 17th century. 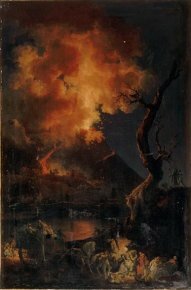 He did not paint just volcanos in Naples and, besides views of Mount Vesuvius (ill. 2), there are two kinds of works : the Vernet style landscapes and the vedute. Despite the repetition in subjects and the lack of dated canvases, his stylistic evolution is quite obvious. He tended « towards a more concise and more efficient painting », reducing his chromatic range, attenuating the contrasts and opted for a lighter effect in his painting. He progressively abandoned the picturesque and decorative elements for a more sober, poetic, sensitive and silent art, "« which would not however attain the muteness of Thomas Jones ». Emilie Beck Saiello also evokes in a more general manner landscape painting in Naples in the second half of the 18th century, by first showing the changes in taste and in the art market, as well as the surge in a new clientele, notably the wealthy bourgeoisie, who usually preferred the « petit genre ». Stylistically, she points out Salvator Rosa’s legacy, then that of Vanvitelli’s vedute, lastly Vernet’s influence, but also includes new tendencies such the lyrical and pre-Romantic vein introduced by British painters. The aesthetics of the sublime (as defined by Burke and Kant) and of catastrophe began to develop at this time, along with two innovations which marked late 18th century art : the encyclopedic vision of the Enlightenment « for which The Construction of a Road by Vernet (Louvre) painted in 1774 might be considered a manifesto », and outdoor painting. Emilie Beck Saiello, Pierre Jacques Volaire (1729-1799), dit le Chevalier Volaire, Arthena, 2010, 486 pp., 119€. ISBN : 9782903239435. As she herself says, quoting Pierre Rosenberg in the journal Perspective, n° 4 of 2006.